The conjunctivitis is still bothering me (hence the title of this post) but I've finally managed to finish the Harad minis I started at the beginning of this month. The quality of pictures is poor as I don't have a camera at the moment and had to use my mobile to take these pics. Unfortunately there won't be better ones as the minis have already been packed and will be sent tomorrow. First off, the Command group. 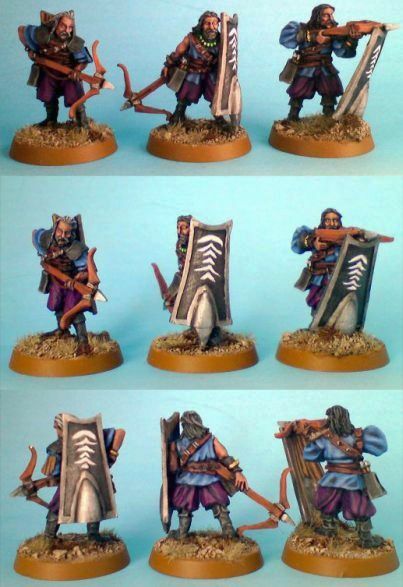 I know that the quality is rather poor but I think that it's a good example of my style of painting lotr minis. I usually try to go for smooth highlights, keeping the colours rather dark. Citadel purples (Liche Purple and Warlock Purple) are definitely my favourites. They work together really well and make highlighting much easier (of course as long as you put at least a few layers of paint and dilute them with water). Here I chose very bright green for the gems as I thought that this element of contrast might look good. The bases are finished according to the client's wish to fit with the rest of his army. And the second part of this batch of minis - Corsair Arbalesters. I really like these minis - long-haired, bearded crossbowmen equipped with large metal shields. Nasty looking dudes, probably useful in the game (I don't play it so I'm just guessing). I know the picture is terrible and doesn't really do them justice but overall I was quite happy with the final result. I went for slightly more sharp highlights here as I thought that their clothes are sculpted in a way that calls for more contrastive shades. 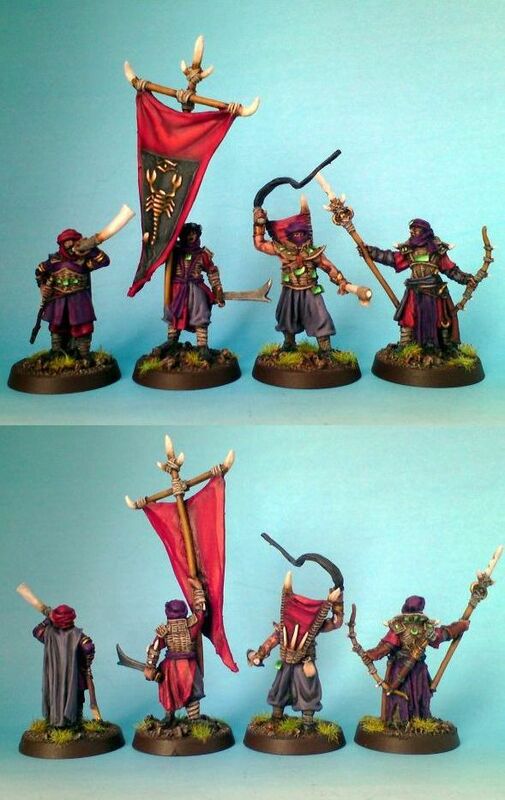 Similarly to Harad command, i went for a slightly darker skin colour, these are desert people after all! Well, that's it for now. Next I'm going to work on a Warhammer 40k commission, Catachan Command and some Ogryns, but there will be another time to write more about it. Have a nice week. Cheers! Thanks, my eyes are much better now that I started using eye drips with antibiotic. Glad you like these, I certainly enjoyed painting them.